The Gumpert apollo is in the fast lane. Exactly three years after series production began in Altenburg, Thuringia; the 40th apollo rolled out of the factory. In 2009, 25 cars will leave the Altenburg factory. Exactly three years after series production began in Altenburg, Thuringia; the 40th apollo rolled out of the factory. And even in times of economic and financial crisis, Roland Gumpert, company founder and managing director, and his 45-man team, are looking at the coming year with optimism, as the Gumpert success story has only just begun. Reason enough to review past experiences and to find out why this super-sportsman is so fascinated with the griffin as a symbol? "The most exciting car to ever wear number plates", was the headline in the British magazine AUTOCAR in early summer 2005. The apollo is a rebel among supercars, and the figures speak for themselves: 8 cylinders, 650 hp, 850 Newton metres and a top speed of well over 300 km/h. But this car isn't exactly lacking in terms of looks either. Be it double wing doors, monstrous air intakes or the huge spoiler for even more downforce. The apollo makes one thing unmistakably clear; form follows function. And makes it successful! "From the first ideas to the start of production was a long and difficult journey", recalls Roland Gumpert. "I returned to Germany at the end of 2001, after over three years in China. As head of sales and marketing I was responsible for the development of the dealer network for the Audi-VW joint venture in China. Here once more, Roland Mayer (MTM) asked me whether, as a project engineer, I would like to assist in the building of a prototype sports car. With the approval of Audi and on the condition that, if we were to develop a new sports car, it would not be a prototype, but a series product that we developed, we began with the apollo project. Roughly three years later, the first two prototypes were completed." It has been confirmed to the Altenburg team more than once that the apollo is not simply a supercar but nearer to being a racing car than any other car before. In many respects, the car is already designed for the racetrack. "Since the beginning, we have placed especially great importance on safety. The tube frame of the apollo is made from chromium molybdenum steel which is also used in the building of aeroplanes. It already fulfils standard international design specifications of the FIA motor sport authorities", affirms Gumpert. The fast car provided evidence of its racetrack capabilities at the "24 hours Nürburgring" in May. The "green hell" became the stage of a spectacular premiere. As F1 regulations will be allowing hybrid systems from 2009, a private team built around former F1 driver Heinz-Harald Frentzen took on the challenge a year earlier: the use of a hybrid racing car in the marathon in the Eifel. With the hybrid version of the Gumpert Apollo, Gumpert Sportwagenmanufaktur has broken new ground. Just three months went by between the first discussions and the finished apollo. The hybrid racer, with its 3.3 Litre V8 bi-turbo engine and an electric motor providing roughly 100 kW, can move at up 630 hp. It wasn’t quite enough to win this time, but it proved that hybrid technology has a future in motor sports. The goals for 2009 have been set high. 25 cars should leave the factory. Destination: The whole world! In the past few months, GUMPERT has been able to find people interested in buying its cars in Europe, the Middle East and the USA: "Needless to say, we would like to further expand our distribution network, mostly towards the East, so Russia and the Asian region or Australia. At the moment we are thinking in terms of the latter two markets as well as about a right-hand drive car"; boasts Gumpert. At the moment the company sells 60% of its cars abroad. One of the new technical developments in the coming year is a hydraulic lift system, which gives the apollo up to 30 mm of additional ground clearance. In addition, there will be a few changes to the design of the fast car. What is it that makes the Apollo so special? This car is so unique in its design, it shines with driving dynamics and power and the car alone knows what driving pleasure and perfect handling really are. Having respect, courage and being a bit of a petrol head are prerequisites for anyone hoping to tame this beast. For Roland Gumpert, one thing is clear: "It is therefore the full package of everything a car needs; namely quality, exclusivity and technology. The customer should stand in front of it and say: "Wow, that's a great car, I want it!" Exclusivity is expressed in uniqueness. Gumpert Sportwagenmanufaktur GmbH is a manufacturer of exclusive super sports cars based in Altenburg / Thuringia – close to the City of Leipzig. The Managing Director is Roland Gumpert. Mr. Gumpert previously worked for Audi for over 30 years and held – amongst other high positions – the position of Director of Audi Sport. Under his management, Audi won a total of 25 World Rally Championship races and 4 World Rally Championship titles. The apollo is a pure uncompromising, street-legal super sports car with extraordinary racing-performance. It provides superior driving abilities beyond all imagination: up to 224 mph (360 km/h) maximum speed and a breathtaking acceleration from 0 to 62 mph (100 km/h) in just 3 seconds. Thereby every car is a unique masterpiece; individually customized to the wishes and desires. Thus it bears the personal touch of its owner. The apollo offers unlimited fun on the road and serious competition in motor sports. A bolide setting benchmarks. 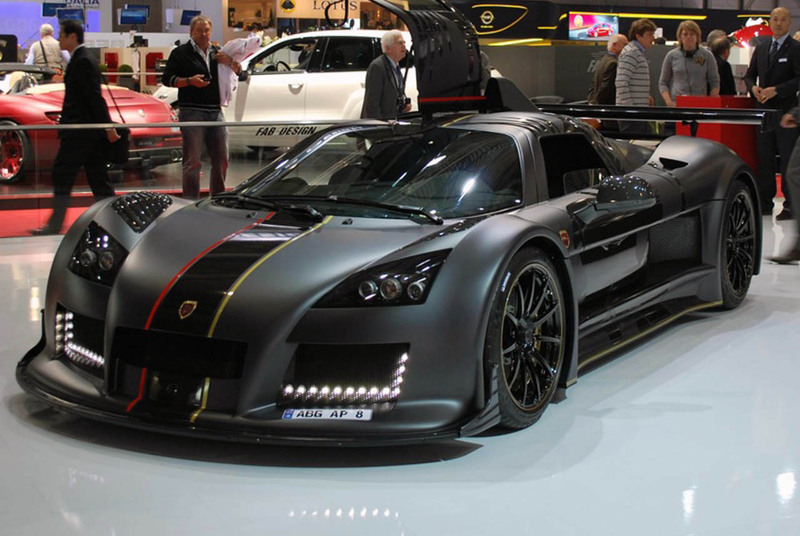 The basic price of the Gumpert Apollo with its V8 4.2 l Twin-Turbo engine - generating 650 BHP - is 301,600 EUR excl. of VAT.